This is a transportation plugin for Bukkit which allows for quick teleportation between any number of locations or worlds. 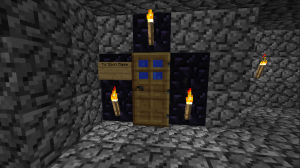 Users build portals using 7 obsidian, a door and a redstone torch, then are able to link them to wherever they choose using a few simple commands. For in-game help, you can also type /portal help. but i have some suggestions :) ..
– do you know some other custom portal plugin that do these things? Firstly, most discussion/etc on this plugin goes on around the bukkitdev page. I still check this, but that contains the most up-to-date information. Just FYI. So, I’ll respond to your questions in order. — I went with the different portal shape due to wanting a unique and more compact style of portal. When I first wrote this, making a 2×1 portal with actual portal blocks was actually impossible. The config.yml file does let you replace any materials you want. You can try the portal material and see how it looks. — The original idea was to up the cost slightly (different materials) and to keep the water in. You should be able to replace it with air in the config files though, yes. — This is not nearly enough information to go on. I can’t really help you without more than that. If you see this and can provide some more information to help me reproduce the problem, please report it on the bug tracker. http://bugs.cpprograms.net/projects/travelportals or on the bukkitdev page. — Not a bad idea, but I’d be worried about efficiency. The plugin was written a number of years ago in a somewhat inefficient way, and looking them up takes time. With the default config, we’d be looking up the list of portals whenever you looked at water, and it would get really laggy. I may look into doing this in an efficient way at some point. — Afraid I didn’t understand this at all, sorry. — I haven’t seen anything else like this, but I’ve kind of fallen out of Bukkit community as of late. I’d take a look at popular plugins on the BukkitDev site, and see what you can find. — I do like this idea, but like the point above, efficiency is a concern. I’ll throw something onto the bug tracker with this idea, and if I ever get time again I’ll see if I can find a way.